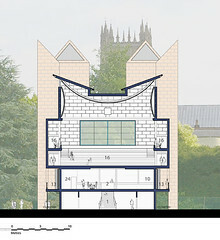 We were invited to submit for this limited competition by Wells Cathedral School in Somerset. The School is over a thousand years old and is one of only four in England that receive special Government assistance for their music teaching. 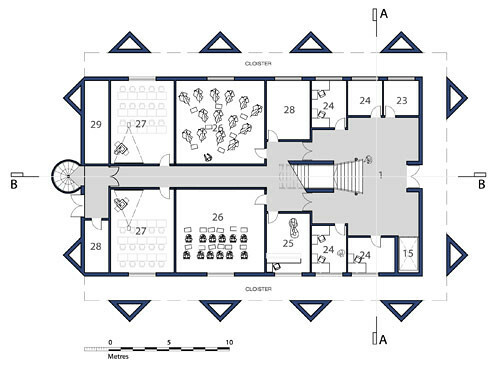 For such a comparatively small town, the School of about 750 pupils is very large, but inhabits a variety of accommodation scattered around the town. 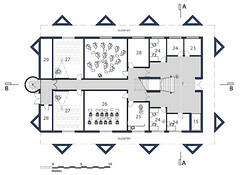 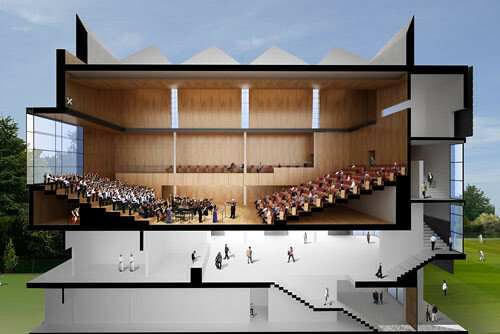 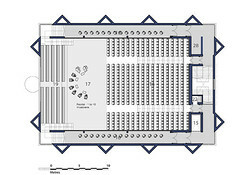 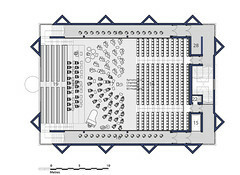 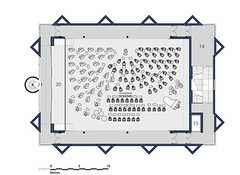 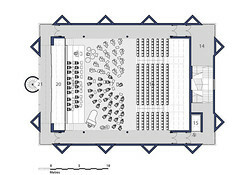 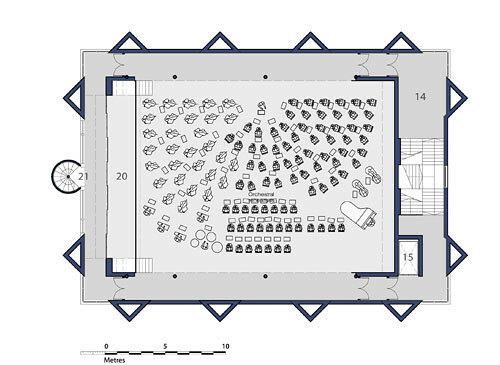 The Cathedral itself has acted as the main performance and assembly space, but as the acoustic of the Cathedral is musically very limiting, the School has resolved to construct its own purpose-designed music auditorium for chamber music with a small audience of 350, or, a reduced audience and 70 strong orchestra and finally to be used for 120 strong orchestra rehearsals. 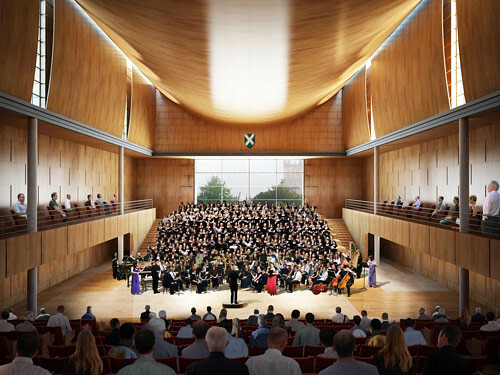 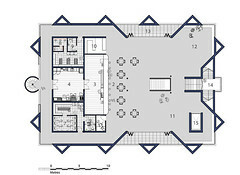 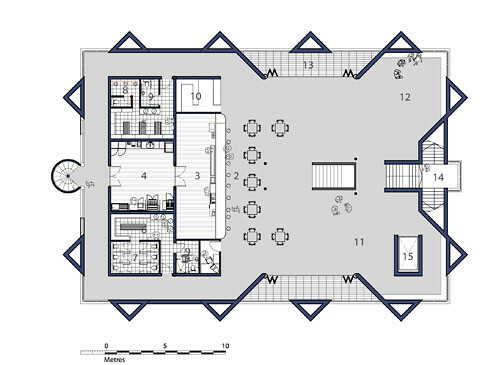 In addition, there is to be foyer, sectional rehearsal spaces and teaching accommodation and the hall should have a public presence as well as being a school facility. 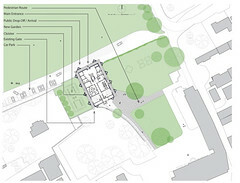 The site chosen is in front of the main administration building, Cedars Hall, but to one side of the view from the Hall to the School's cricket pitches. 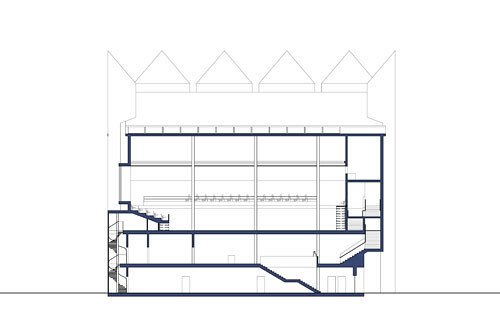 Our competition proposal made a vertical building; teaching accommodation, green rooms etc on the ground floor; the first floor reserved entirely for foyer with the auditorium at second floor level with third floor balconies. 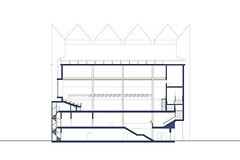 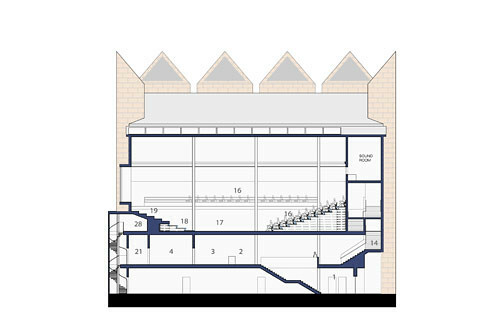 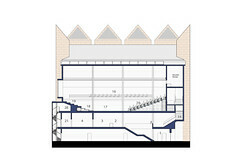 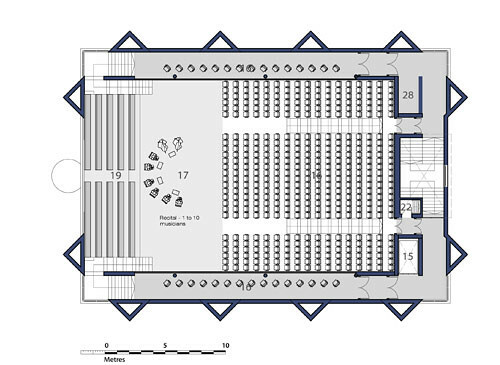 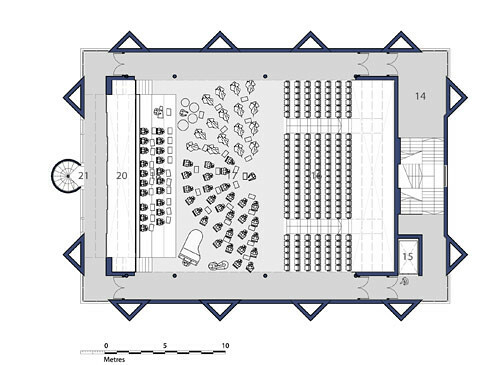 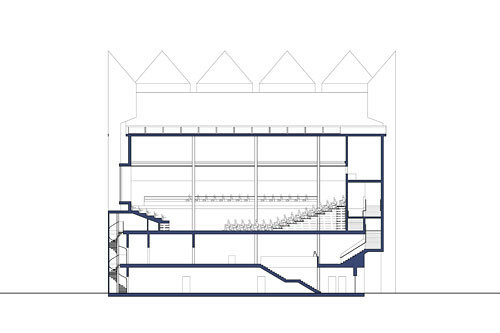 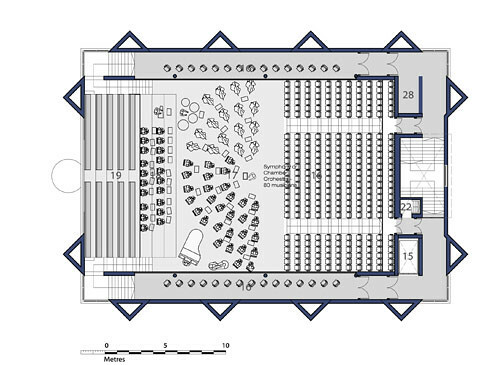 Retractable seating allows for the three main configurations as illustrated. 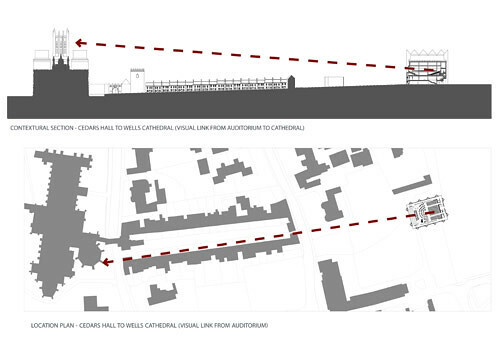 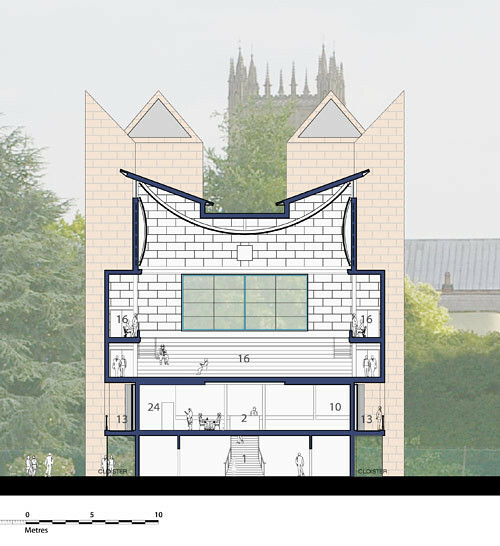 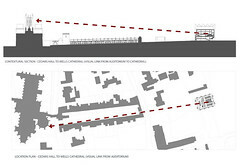 A heavy construction was proposed with natural ventilation chimneys; the result is modelled verticality of the form of the building which is located within the gothic tradition of the Cathedral and Chapter House, and yet is recognisably of our own time. 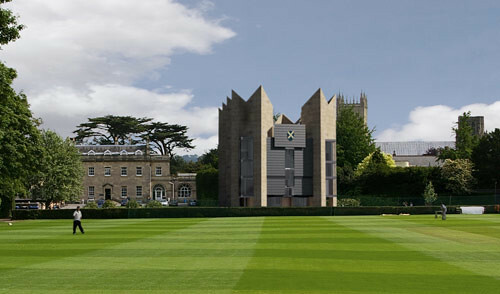 The overall size and presence of the building deliberately emphasises the intention that not only is this new construction the most important and public building the School has constructed within its thousand year history, but it also takes its place as one of the most recognisable and significant public buildings within the town. 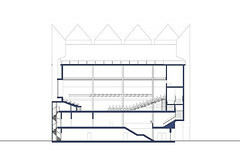 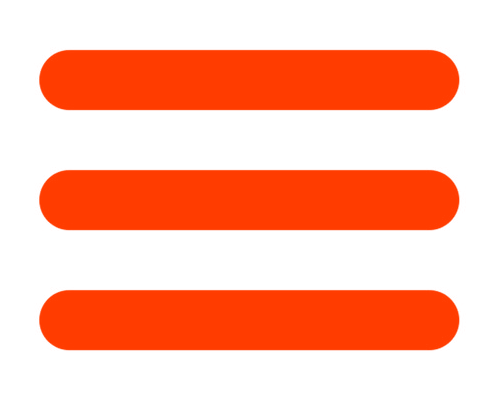 We were unsuccessful on this occasion and a design by Eric Parry has been chosen.